During the period leading up to and following Nigerian independence in 1960, artists appropriated cultural and aesthetic traditions from around the country as a means of defining a new national identity. They drew upon narratives from Yoruba, Igbo, Urhobo and other cultures, Bible stories, local histories and artistic traditions to inform the content and style of their works, manipulating tales from the past to produce a mythology for the present. This practice was defined as “natural synthesis” by the Art Society at Zaria, an arts group formed in the late 1950s by Uche Okeke, Demas Nwoko, Simon Okeke, Bruce Onobrakpeya and other art students at the Nigerian College of Arts, Science and Technology (now Ahmadu Bello University) at Zaria in the northern region of Nigeria. The Art Society sought to reconsider the emphasis on Western academic artistic traditions espoused by the largely European faculty at Zaria, an art program associated with Goldsmiths (part of the University of London). Moving away from traditions steeped in colonialism, “natural synthesis” merged the best of indigenous art traditions, forms and ideas with useful ones from Western cultures to create a uniquely Nigerian aesthetic perspective. Later known as the Zaria Rebels, the members of the Art Society devised an academic program outside of the official university curriculum. The members thoroughly researched indigenous cultural and artistic traditions, produced works based on their findings and met regularly to discuss the outcomes. Though they took a similar conceptual approach to art making, the vast diversity inherent in the practices they analyzed led to great variation in their formal and stylistic synthesis. Uche Okeke, the Art Society’s second president, drew inspiration for a new visual language from uli, an Igbo female body and wall painting tradition from southeastern Nigeria that is based on sinuous abstract forms derived from nature (above). In uli, Okeke saw “limitless expression,” internalizing the drawing technique he learned from his mother, a renowned uli draughtswoman, to serve a modernist sensibility. 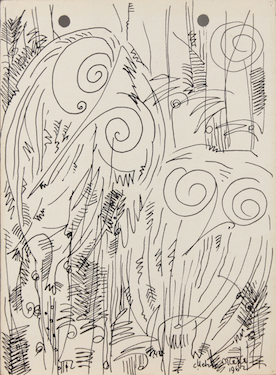 While waiting in Abule Oje, Lagos in 1962 for traveling papers to Munich, Germany, where he was to train in stained glass and mosaic at the Franz Meyer Studio, Okeke created a series of pen and ink drawings that make up his remarkable Oja Suite. In one drawing, Owls (left), vertical lines, zigzags, spirals (agwolagwo or snake motif) and v-shapes (okala isinwaoji or three-lobed kola nut motif) come together to form two owls perched amidst dense foliage under a full moon. With his spare manipulation of line and spontaneous employment of uli symbols, Okeke distills cosmic and animal forms to their essential components. Okeke does not simply mimic uli forms but internalizes the flowing, poetic process of the drawing tradition itself, analyzing and exploiting its formal potential. In drawings like Owls, the meanings of particular uli symbols become untied from their referents and depend entirely upon the other lines, motifs and spaces within the composition for interpretation. In Okeke’s hands, the flowing lines and naturalistic patterns of uli converge to form vegetal, human and animal compositions that give form the artist’s conception of a new Nigeria. After his return from Germany in 1963, Okeke settled in Enugu, then capital of Nigeria’s Eastern Region. With the help of other former Art Society artists, Okeke established a cultural center, which he directed from 1964 to 1967. Modeled on prominent scholar Ulli Beier’s Mbari Artists and Writers Club in Ibadan, Okeke’s Mbari Enugu brought together artists, writers, dramatists and intellectuals to exchange ideas, collaborate, exhibit and discuss new work. From 1967 to 1970, Nigeria’s brutal civil war, known as the Nigerian-Biafran War, tore apart the newly independent nation with economic, ethnic, cultural and religious conflict. Though the southeastern provinces attempted secession to establish the short-lived Republic of Biafra, Nigeria remained largely united despite endemic corruption, poverty, inequality and injustice. In the lead up to and during the war, Okeke mobilized participants at the Mbari to produce art, literature and performances that reflected their experiences of the conflict. With a heightened awareness of the failure, hope and tragedy of humanity, Okeke produced works like Refugee Family (1966) that meditated on the pogroms (organized massacres of particular ethnic groups) inflicted upon Igbo in Northern Nigeria at the start of the war. Alienated figures in earth tones are sparely outlined with thick uli-influenced strokes. 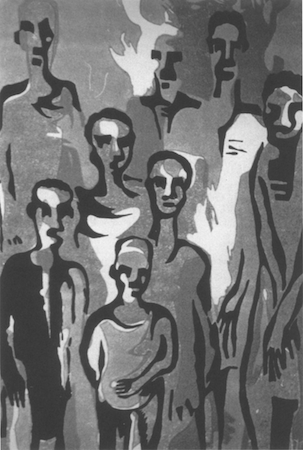 The work’s modest medium (linocut on paper) and technique represent the artist’s need to process the conflict through visual production, despite the dearth of art materials available at the time. After the war, Okeke joined the faculty of the University of Nigeria, Nsukka, where he ran the Department of Fine and Applied Arts from 1971 to 1983. Under his direction, Nsukka rose to prominence as a center of Nigeria’s artistic creativity, drawing artists like the renowned El Anatsui to its ranks. At Nsukka, Okeke further developed his synthesis theory, encouraging students to research Nigerian art traditions to solve formal problems in their work. 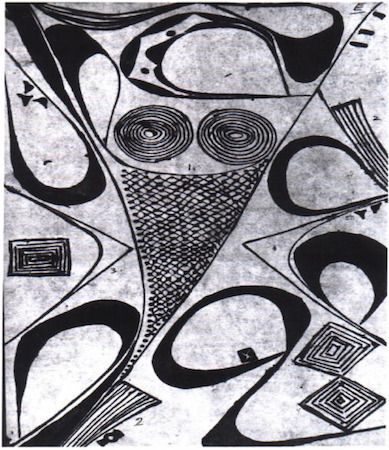 The artist’s own experiments with uli became increasingly abstract in prints like Isi Nwoji (1972) where uli motifs, like the diamond-shaped kola nut (isioji), are clearly defined but with a bolder graphic approach. The oil boom of the mid-1970s expanded Nigeria’s income capacity, but also brought massive official corruption and the institution of a series of military regimes from 1983 to 1998. Under Okeke’s supervision, Nsukka students like Obiora Udechukwu manipulated uli, and later nsibidi, another indigenous graphic system, and even Chinese li calligraphy to give form to the social and political struggles preoccupying everyday life in Nigeria. Through Udechukwu, who later became a prominent professor at Nsukka, Okeke’s rigorous intellectual inquiry into uli influenced another generation of artists, including Tayo Adenaike, Olu Oguibe, Chika Okeke-Agulu and Marcia Kure, among others. Like Okeke, these artists continue to think deeply about place and history in their very contemporary manipulations of design traditions from the past. Ulli Beier, Contemporary Art in Africa (London: Pall Mall Press, 1968). Clementine Deliss, Seven Stories about Modern Art in Africa (New York: Flammarion, 1995). C. Krydz Ikwuemesi, ed. The Triumph of a Vision: An Anthology on Uche Okeke and Modern Art in Nigeria (Lagos: Pendulum Art Gallery, 2003). Chika Okeke-Agulu, “Nationalism and Rhetoric of Modernism in Nigeria: The Art of Uche Okeke and Demas Nwoko, 1960-1968,” African Arts, vol. 39, no. 1 (Spring 2006): pp. 26-37, 92-3. Simon Ottenberg, New Traditions from Nigeria: Seven Artists of the Nsukka Group (Washington, D.C.: Smithsonian Institution Press, 1997). Simon Ottenberg, ed. The Nsukka Artists and Nigerian Contemporary Art (Washington, D.C.: Smithsonian National Museum of African Art and University of Washington Press, 2002). Cite this page as: Perrin Lathrop, "Uche Okeke," in Smarthistory, February 6, 2016, accessed April 20, 2019, https://smarthistory.org/uche-okeke-3/.